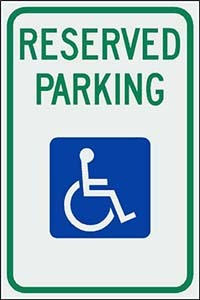 In 2011 the current A.D.A (Americans With Disabilities Act) was amended from the original 1990-1991 version. As of March 15, 2012 compliance with Title III became mandatory. A portion of Title III gives guidance on compliance with accessibility in relation to handicap parking stalls, traffic signage, curb ramps and detectable mats / truncated domes. The mandate covers MANDATORY compliance for commercial / industrial properties, hotels, convenience stores, retail stores, public parks, recreation facilities, hospitals, sporting facilities, colleges / universities and any other commercial property that is visited by the general public. Contact us today for an ADA Inspection of your parking lots and sidewalks with a comprehensive compliance report. Our Pavement Guardian program offers property / facility managers peace of mind when it comes to monitoring and maintaining your parking lots. Identification of life safety issues. Service is free of charge to Preferred Clients Group and Maintenance Service Agreement clients. We offer our clients, MSAs or maintenance service agreements, which is our proactive method for maintaining your asphalt parking lots. Many times a property / facility manager will perform a seal coat and re-stripe on a parking lot and then postpone future maintenance / inspections for 3 – 5 years. The issue with this type of practice is during those 3 – 5 years, small cracks turn into large cracks, pot hole and alligator cracked areas turn into large expensive removal and replacement projects; all of these unplanned and unbudgeted for. You begin to notice cracks and pot holes. You contact a vendor for a quote to make the necessary repairs and have “sticker shock” when you see the cost to rehabilitate the parking lot 5 years down the road. Our maintenance agreements prevent this from occurring from “proactive” pavement management. Our plan enables us to visit the property 1 – 2 times per season (spring & fall) to make necessary repairs. In the winter we evaluate and crack seal to make sure small cracks do not turn into large cracks, small potholes do not turn into large tripping hazards etc. In the spring we visit the site to perform an inspection, touch up any worn out striping and / or complete re-stripe. Our maintenance agreements work in the same fashion as an extended warranty on your asphalt. For a fixed cost per square foot, per year, we can give you and your clients, peace of mind in knowing you only have to budget one cost per year to maintain your asphalt parking lots. The maintenance agreements also cover emergency repairs (collapsed catch basins, emergency striping for A.D.A or fire lane issues, tripping hazards etc) for a reduced cost. Every spring & fall rest assured your parking lot proactive maintenance will be on autopilot. Servicing NJ, PA, DE, MD & VA. Extended service is available; please contact us for further details. Please contact our office immediately at 1-(877) FIX-ASPHALT if any of these issues arise.